This PDF 1.6 document has been generated by FrameMaker 7.1 / Acrobat Distiller 6.0 (Windows), and has been sent on pdf-archive.com on 19/12/2018 at 14:37, from IP address 85.203.x.x. The current document download page has been viewed 45 times. File size: 799 KB (18 pages). clamp away from fuel priming pump (6). 7. Disconnect hose (10) from fuel priming pump (6). 2. Turn the fuel supply to the OFF position. 4. Disconnect hose (4) from fuel priming pump (6). harness assembly (2) (not shown). 11. Remove fuel priming pump (6) from bracket (3). components that are worn or damaged. 13. If necessary, follow Step 13.a. through Step 3.g. in order to remove bracket (3). 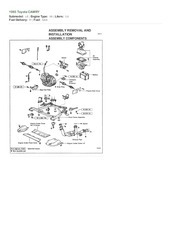 harness assemblies away from bracket (3). order to install bracket (3). d. Remove bolts (12) from bracket (3). b. Position bracket (3) to the cylinder block. e. Remove bracket (3) from the cylinder block. c. Install bolts (12) to bracket (3) hand tight. f. Remove gasket (11) (not shown). hose clamp is correctly positioned. harness assemblies away onto bracket (3). harness assemblies is correctly orientated. - Prime” for the correct procedure. 5. Position fuel priming pump (6) onto bracket (3). 9. Connect hose (10) to fuel priming pump (6). 12. Connect hose (4) to fuel priming pump (6). 15. Turn the fuel supply to the ON position. 13. If necessary, follow Step 13.a. through Step 13.c. b. Remove bolts (12) from bracket (3). c. Remove bracket (3) from the cylinder block. 4. Position fuel priming pump (6) onto bracket (3). 8. Connect hose (10) to fuel priming pump (6). a. Position bracket (3) onto the cylinder block. b. Install bolts (12) to bracket (3) hand tight. 11. Connect hose (4) to fuel priming pump (6). 14. Turn the fuel supply to the ON position. System Filter - Replace” for the correct procedure. weight of the bracket as the bolts are removed. voltage dropper (11) from bracket (7). 10 N·m (89 lb in). any component that is worn or damaged. of 10 N·m (89 lb in). j. Install harness assembly (12) to bracket (7). 4. Install bolts (2) to fuel filter base (1). align the bracket (15) with bracket (7). 6. If necessary, install a new fuel filter element (5). of 25 N·m (221 lb in). e. Remove the temporary bolt from Position (X). 5. 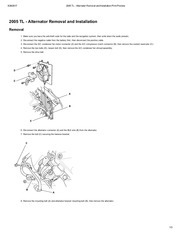 Tighten bolt (2) to a torque of 25 N·m (221 lb in). cap from tube connection (3). 8. Connect tube connection (3) to fuel filter base (1). contact any other engine components. cap from tube connection (4). 10. Connect tube connection (4) to fuel filter base (1). The fuel injectors will be damaged if the top of the injector turns in the body. 11. Turn the fuel supply to the ON position. injection lines (3) from fuel injectors (2). injection lines (3) from fuel injection pump (5). fuel injection pump (5) immediately. three cylinder and the four cylinder engines. 9. Remove banjo bolt (9) from fuel return line (6). 10. Remove sealing washers (10). 11. Remove fuel return line (6) from fuel injectors (2). 1. Remove the caps from fuel injectors (2). Note: The sealing washers have two small holes. 2. Install new sealing washers (8) to fuel injectors (2). 3. Install fuel return line (3) onto fuel injectors (2). loosely to fuel injectors (2). 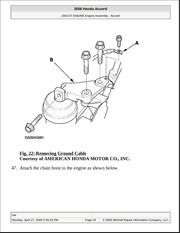 6. install banjo bolt (9) to rigid fuel return line (6). 8. Tighten banjo bolt (9) hand tight. torque of 27 N·m (239 lb in). suitable container for storage or disposal. Sulfuric Acid Burn Hazard may cause serious personal injury or death. 11. Remove the caps from fuel injection pump (5). 12. If necessary, the caps from fuel injectors (2). and fuel injection pump (5). injectors and in the fuel injection pump. injection lines (3) to a torque of 23 N·m (204 lb in). 18. Turn the fuel supply to the ON position. 1. Loosen hose clamp (11) on hose assembly (10). 2. Loosen hose clamp (9) on hose assembly (8). 9. Remove exhaust cooler (NRS) assembly (7). 12. 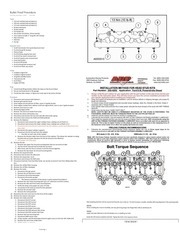 Tighten bolt (17) to a torque of 25 N·m (221 lb in). as the nut is tightened. cooler (NRS) should not be carried out. assembly (7) and exhaust manifold (13). 5. Loosely install nut (15). cooler (NRS) assembly (7) as bolt (17) is installed. 10. Apply Tooling (A) to the threads of bolts (12). (NRS) (7). Tighten hose clamp (11) securely. (NRS) (7). Tighten hose clamp (9) securely. gasket (5) (not shown) onto tube assembly (1). 20. Install bolts (2) and bolts (6) to tube assembly (1). is not stranded as the bolts are tightened. assembly (2) from the fuel priming pump bracket. control (3) from cylinder block (5). 4. Remove sealing washer (4) (not shown). This file has been shared by a user of PDF Archive. Document ID: 01902831.